Another summer come and gone, kids (and parents) are gearing up to go back to school – but don't fear! 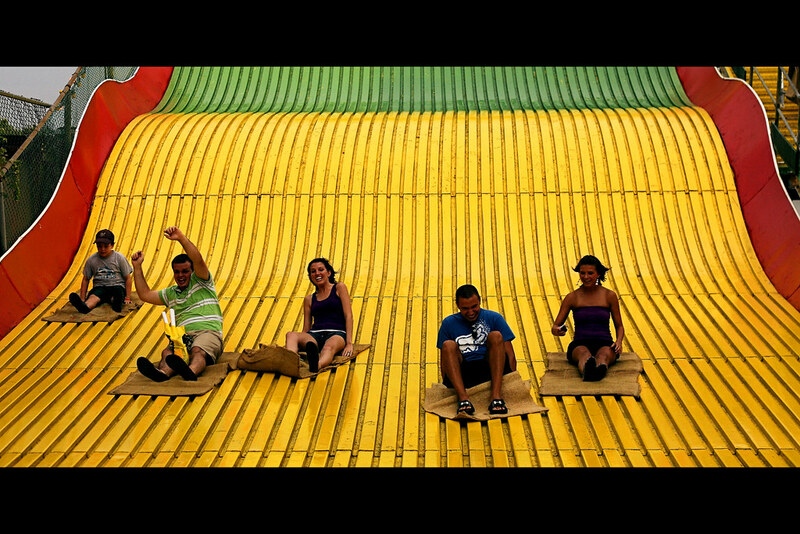 You still have 48 hours to get down to the one and only Iowa State Fair. With over 100 years of business in Iowa, we like to think we know our state fair pretty well. Check out some of our favorite fair stops, and stop by our booth when you need a break from the sunshine! Depending on your chosen entrance, the Lion's Club Spin Art could be your first stop. Satisfy your kids' creativity before they get knee deep in fried foods. Figure out your State Fair plan of attack while your kids spin up a few of their beautiful creations for just a few dollars – hey, they make great holiday gifts! With a fresh coat of paint, the giant slide returns this year to the Iowa State Fair under its new name, the Reichardt Family Giant Slide. Even little 3-month-old Rowan Reichardt took a ride down the fair favorite with his pops. No matter what age, you can always grab a gunny sack, climb those metal stairs, and let the wind blow through your hair for just a few seconds. We know there's plenty of fried foods to try each year at the fair, but don't leave until you get the classic Campbell's Corndog. This Iowa hand-dipped corn dog stand is one of the most popular stands every year, and they've expanded their menu for those of you itching to test the limits of food fandom: double bacon corndog, Iowa's Big Pork Leg, and more. Take a step into the past with Pioneer Hall, built in 1886 for the first fair and the only originally constructed building that remains on the fairgrounds. It hosts everything from the rooster calling competition to the tractor engine display. Check out their scheduling for any number of traditional American music concerts, including bluegrass, country, and rockabilly for you dancers out there. Last but not least, the Varied Industries Building. Amongst hundreds of Iowa companies, schools, and organizations, you'll find us in the southwest quarter of the building at booths 561, 562, 619, and 620. We're featuring some of our best sales all year! Come celebrate 100 years of G&L Clothing before the fair closes for another year on Sunday night. Can't make it to the fairgrounds? Don't worry! We're offering special 100 Year Celebration sales in-store all year long.